Melissa is also looking for this rabbit. I am looking to replace my daughter’s childhood bunny. I think it might have been Carter’s, but the label is too old to read. 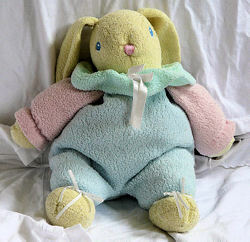 It is 11 years old and is about 12 inches tall and has a rattle inside. The material is terrycloth or a similar material.The body is baby blue, the head, feet and hands are light yellow and the arms are light pink. It also has a mint green ruffle around the neck with a white ribbon bow on it. The eyes are stitched in blue and the nose is stitched in pink. The tail is yellow and the ankles also have white ribbon bows around them. I would greatly appreciate any help you can give me to locate one of these. My daughter is 11 now and still sleeps with her “fat bottom bunny” every night. She even takes her to sleepovers with her. I think this is still amazing for a little girl her age to still love a childhood toy so very much. Her bunny is starting to get very fragile ans she asked if we could find her another one, so she could preserve her original one before it falls apart. If you are still searching here is another very close option. Let us know.